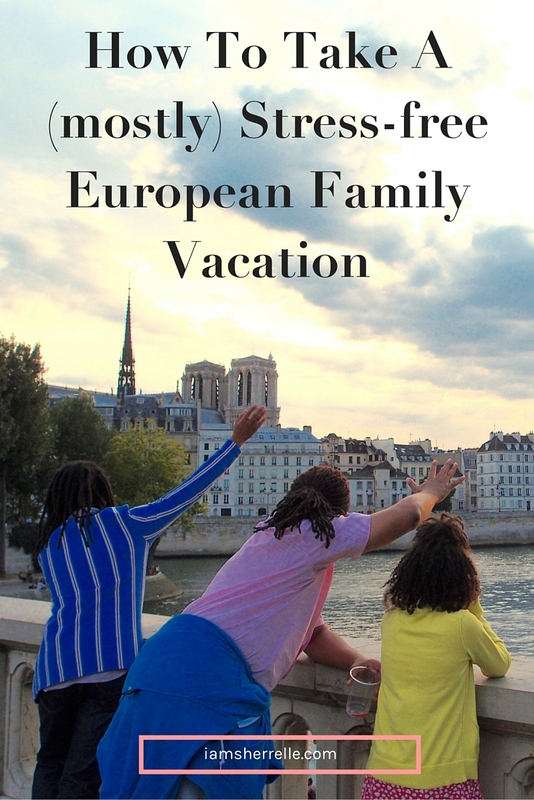 I took a European family vacation to London and Paris this summer. I learned a few things. 1.The grocery stores in London are great. Waitrose and Mark & Spencers are great for fresh food to go and Whole Foods in South Kensington is incredible. Even if you don’t eat there, just go look and wander around. Sample the gelato made with buffalo milk! Public transportation in London is very clean and easy to use. We bought a one week Oyster Card and it was worth it; we used the tube several times a day. My daughter (aged 9) didn’t pay to ride. Crossing the street was harrowing; we felt like we literally risked our lives each time we crossed the street. But people do it everyday and we didn’t see anyone get hit. When you see the green man, cross the street and quickly. Run if you have to! When he turns red, the cars will go–even if you haven’t made it safely to the other side. Get out of the city for another perspective. We took a trip to Windsor & Eton and it was lovely. Our only regret is that we got a late start and didn’t see as much as we would have liked. Reserve a whole day to walk around the towns and see the castle leisurely. Be mindful that the shops close at 6:00 p.m. and they mean it. Bring a coat; it’s cold! And it rains, so bring an umbrella – no matter what your husband says. If you are taking the Eurostar to Paris, one word: margin. Try to speak French. I learned some conversational French before our trip and used it. Everyone I spoke to encouraged me (and corrected me, but that was good). It is true that most people speak English in Paris, but there were a few times when my limited French was our only mode of communication. I ordered lunch in a tiny boulangerie, asked about buying Metro tickets and talked to a police officer at the Eiffel Tower. Her little English and my little French produced a whole conversation about the Eiffel Tower lights, fireworks and traveling. I am inspired to learn more French; I love it! Walk as much as possible. Paris is a wonder and the best way to see it is on foot. Choose a neighborhood, take the Metro or bus there and then walk around. Turn down tiny streets and see what you can see. Take a paper map. While smartphone apps are useful, technology fails and Paris is a very big city with very small streets and it’s easy to get lost. And guess what? Everything is in French! You WILL get lost, but it’s okay. Find a cafe, sit down for a cup of tea or a glass of wine and figure it out. Use the public transportation. Because we walked as much as possible, we only took the Metro a few times, the bus twice and the train once; the rest of the time we walked. As such, we didn’t need an extensive transportation card; we just bought a carnet (book of ten tickets). Don’t put them in your wallet near your credit card or they may lose their magnetic power; that happened to us. The buses were nicer to ride than the Metro, but there are many lines and it’s easy to get confused. The iPhone app “Hop Stop” was invaluable for planning our Paris transportation routes. 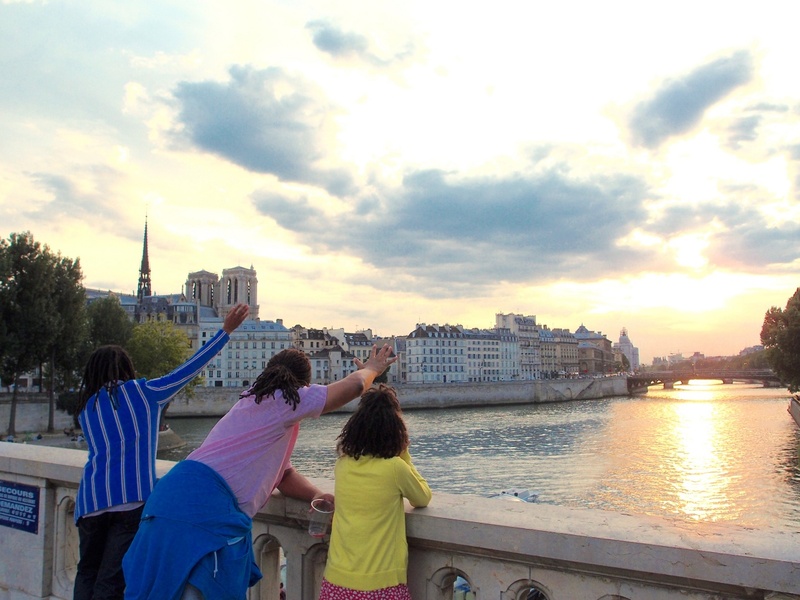 As much as we LOVED Paris, there is one thing that we did not like: dog poop. We love dogs, we just don’t like the owners who don’t pick up after the dogs! My daughter counted 178 dogs in Paris (several of those were inside restaurants and stores; Parisians love their dogs). This very beautiful city has a very serious dog poop problem. As my son said, this is very perplexing for a city that loves high-fashion shoes. Be mindful of where you step! Restaurants and cafes are not for quick eating: you don’t rush them and they don’t rush you. Eating in Paris is a leisurely affair, with time to drink, talk and people watch. Plan for a long meal and enjoy it. Like London, Paris is extremely expensive. If you’ve ever vacationed in New York City, you have an idea. If a burger in Atlanta is $10, it’s $15 in New York and $20 or more in Paris. It is what it is. Save where you can by eating take-out for breakfast (or make breakfast in your apartment, like we did), grab sandwiches for lunch at a boulangerie and buy snacks at the grocery store. Then if you have one restaurant meal a day, it’s not too bad. Do what you must to afford it, but be sure to budget money for meals. Paris has amazing food! Cafes, patisseries, and boulangeries are everywhere, but sometimes my kids (and husband) needed a snack at the most inopportune time. By the second day we got smart: we bought a baguette every morning, cut it up and carried it around in a Ziploc bag. This worked especially well for snacking in long lines. We also carried juice boxes and water from the grocery store in a small lunchbox. Need a bathroom while walking around? Stop at a cafe for a quick drink. A note about fashion: this is a fashionable place, do try to blend in. However, comfortable shoes are a must. This is always a struggle for me – to look fashionable, yet comfortable. I didn’t really succeed. I had very cute, Parisian-looking flats, but despite the Cole Hann/Nike Air technology, my silver flats were not meant for walking ALL day like we did. I compensated by changing shoes mid-day and stretching often. As for clothes, it was cooler than I thought it would be in Paris and the Weather Channel app was not accurate at all; it was either warmer or cooler than predicted. Layer with a sweater or jacket and add a fashionable scarf; you can add or remove pieces as needed. I had packed a pair of black capri tights for my daughter and that worked well under her dresses or shorts for cooler days. I wish that I would have packed the same for myself and next time I will; I saw many Parisian women with tights under dresses, skirts or shorts and it was a chic (and warm) look. You will be lost – all the time. You will not speak the language. You will get on each other’s nerves. You will be exhausted. You will spend so much money that you will have to eat beans for dinner when you return home. The adventure you have, the fun you share and the excitement you feel will last a lifetime. P.S. You may also like these posts about Paris and London. Booking my trip with friends for Berlin & Paris in January! Thank you for the food/budgeting tips! We’ll be packing snacks for sure! My last trip I spent way too much on food. 🙂 Thanks again. Sounds like fun! Check my blog in a few weeks…I’m going back to Paris next week, so I’m sure I’ll post about it (from a different–winter–perspective). It’s going to be cold! Fantastic! I love the tip about how to budget money for food in Paris. I will definitely keep it in mind when I go. I love your end quote. Just Go! and I will! I can’t wait for you to go; I know that you will love it as much as I do! Oh thats for sharing. I plan to go to Paris in 2 years. Your tips have been helpful. I do not speak French at all, lol. I better start practicing. I learned most of my conversational French from iPad and iPhone apps! And it was handy to have on my phone when I was there. But you have plenty of time to take a French class!